You may have noticed I’ve been experimenting more with gluten-free baking. No, The Daring Gourmet isn’t gluten-free. 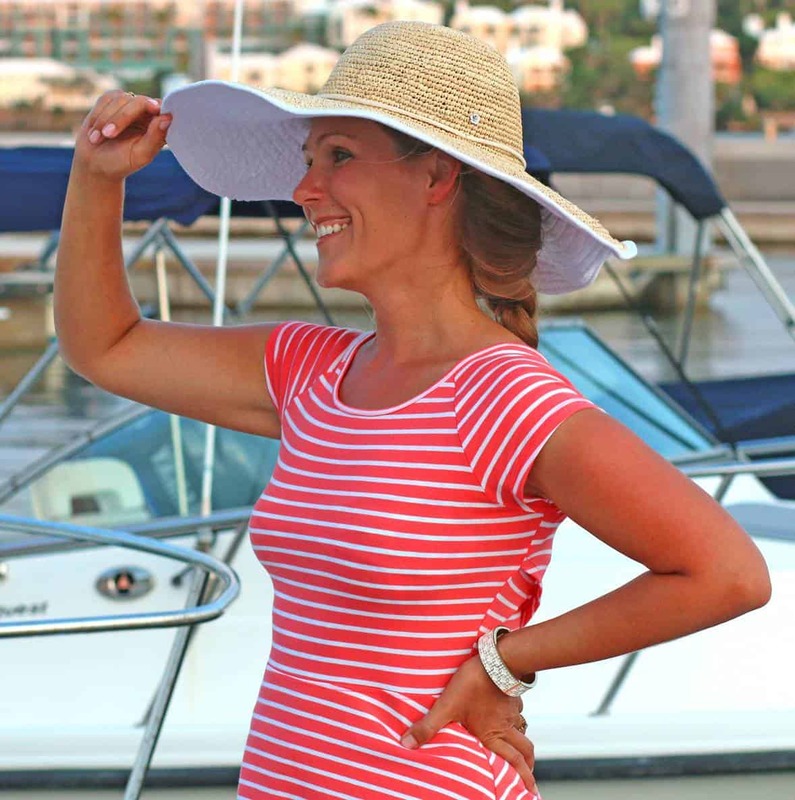 I just like adding variety to my blog. Plus, I like to have alternatives to gluten for myself and my family. Our son just celebrated his 7th birthday and, believe it or not, his request was for carrot cake. 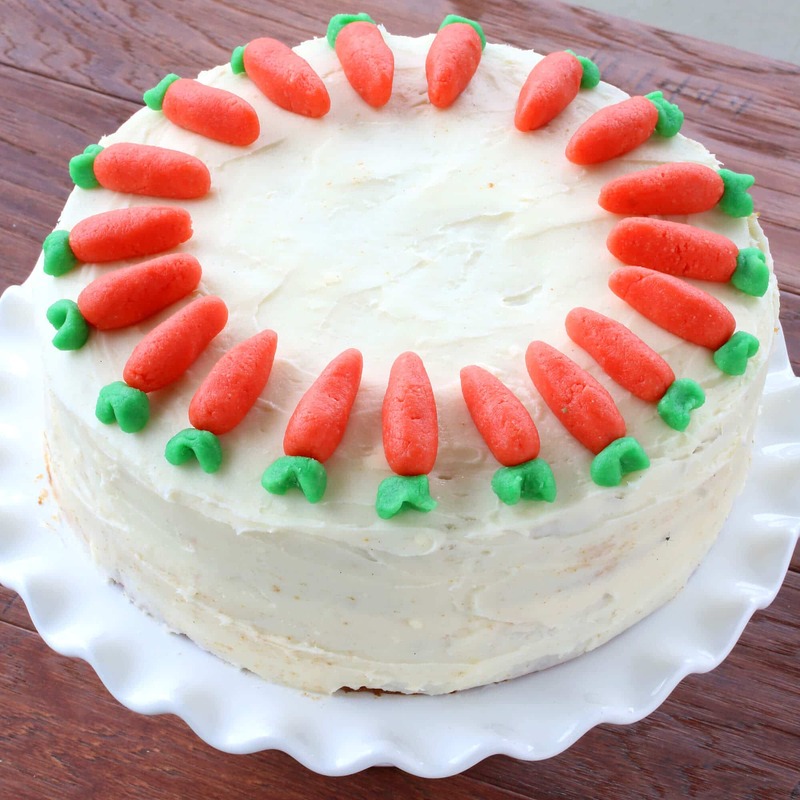 Specifically, a carrot cake decorated with marzipan carrots like he had seen me make a couple of years ago. It obviously made an impression on him at the time for him to have remembered those! So while I was at it, I thought I’d develop a gluten free carrot cake – one so tender and moist and full of flavor that no one would ever guess it’s gluten free. Everyone loved it, had seconds, and our son ate his fill of the marzipan carrots, including the leftovers. Check out that gorgeous tender and moist crumb. This is a carrot cake you don’t have to worry about serving to your gluten-eating friends, because even if they can tell the difference, they’ll love it just the same! I’m including a tutorial for making the marzipan carrots but they are completely optional. As I mentioned above, they come by way of request from our 7 year old son and are super easy to make, look neat, and taste delicious. Feel free to omit them if you like and use any decorations (or none) or your choice. Feel free also to convert this cake into a sheet cake instead of two layers. Simply do that by baking the batter in a 9×13 inch cake pan instead of two 9 inch round pans. 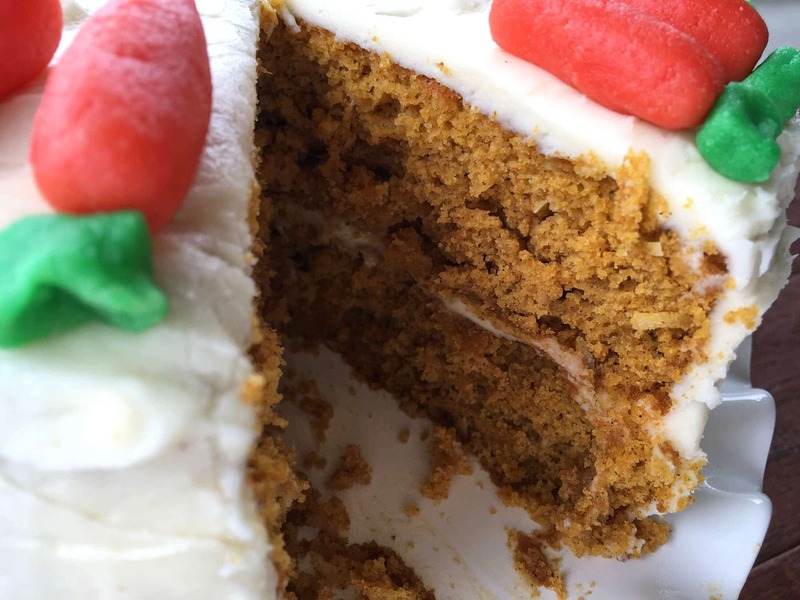 If you prefer a dairy-free carrot cake, simply substitute the milk for nut or rice milk and use a non-dairy cream cheese frosting. Boil the carrots until they’re soft, then drain, puree them, and let them cool a little. Set aside until ready to use. In a small bowl, combine the flours, baking soda, xanthan gum, salt, cinnamon, and nutmeg. In a larger bowl, add the sugars, eggs, oil and vanilla extract and beat until combined. Add the milk, pureed carrots and pineapple and stir to combine. Add the toasted coconut (if using) and flour mixture and stir just until combined. Be careful not to over-stir. Grease two 9-inch baking pans (or a 9×13 inch baking pan if using instead) and pour equal amounts of batter into the pans. In an oven preheated to 350 degrees F, bake for 35-40 minutes or until a toothpick inserted into the center of the cake comes out clean. Let the cake cool in the pans for about 5 minutes and then carefully invert onto a wire rack to cool completely. To prepare the cream cheese frosting: Place the butter and cream cheese in a large mixing bowl and beat with an electric beater until combined. Add the powdered sugar and vanilla extract and beat until smooth. Frost the top side of the bottom layer and set the second layer on top of it. Frost the rest of the cake. To make the marzipan carrots, make one batch (a half batch is adequate) of Easy Homemade Marzipan (or use storebought). Use a ratio of 2:1 yellow to red food coloring to make orange-colored marzipan. Use green food coloring to color a little bit of marzipan green for the leaves. Check out this all-natural food coloring. Shape the orange marzipan into small carrots and set them on wax paper or other non-stick surface. Break of tiny bits of green marzipan, shape them into foliage, and press them to the carrots. Set aside until ready to use. These can be made several days in advance, just keep them covered/airtight so they don’t dry out. 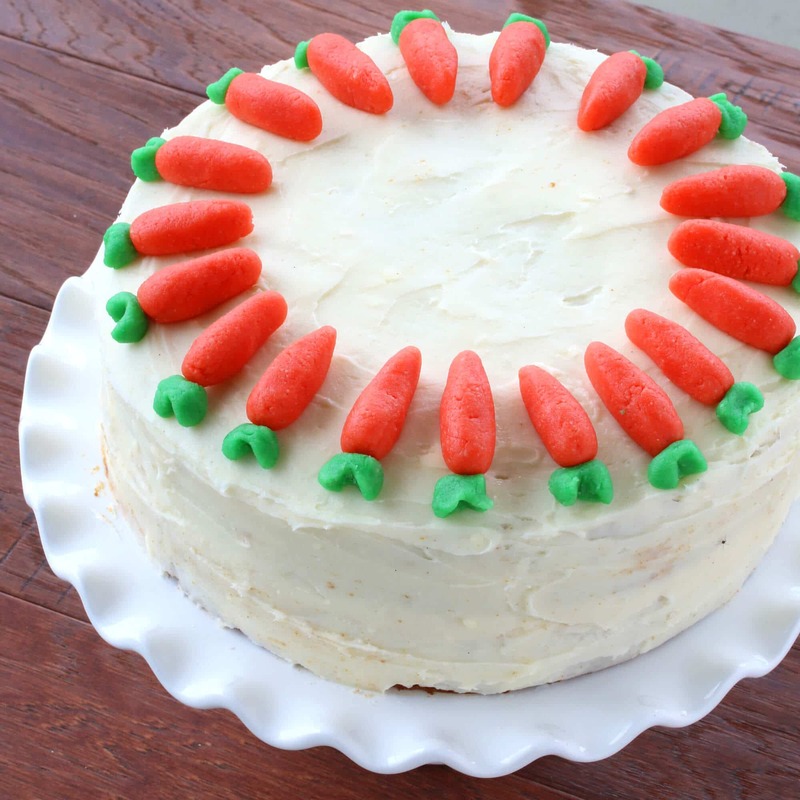 Arrange the marzipan carrots on the cake. Your cake is now ready to serve! Cut the cake into wedges so that each slice has at least one marzipan carrot on it. Grease two 9-inch pans. (If making a sheet cake instead, grease a 9x13 inch pan). Preheat the oven to 350 degrees F.
Add the flour mixture and toasted coconut (if using) and stir just until combined. Be careful not to over-stir. Pour equal amounts of batter into the pans. Bake for 35-40 minutes or until a toothpick inserted into the center of the cake comes out clean. Let the cake cool in the pans for about 5 minutes and then carefully invert onto a wire rack to cool completely. To Make the Cream Cheese Frosting: Place the butter and cream cheese in a large mixing bowl and beat with an electric beater until combined. Add the powdered sugar and vanilla extract and beat until smooth. Can be made in advance. To Make the Marzipan Carrots: Use a ratio of 2:1 yellow to red food coloring to make orange-colored marzipan. Use green food coloring to color a little bit of marzipan green for the leaves. Shape the orange marzipan into small carrots and set them on wax paper or other non-stick surface. Break of tiny bits of green marzipan, shape them into foliage, and press them to the carrots. Set aside until ready to use. These can be made several days in advance, just keep them covered/airtight so they don't dry out. Cut the cake into wedges so that each slice has at least one marzipan carrot on it. Serve and enjoy! Carrot cake is my husband’s favorite! He won’t believe me when I tell him the cake I’m making is gluten free. Looks so so delicious. 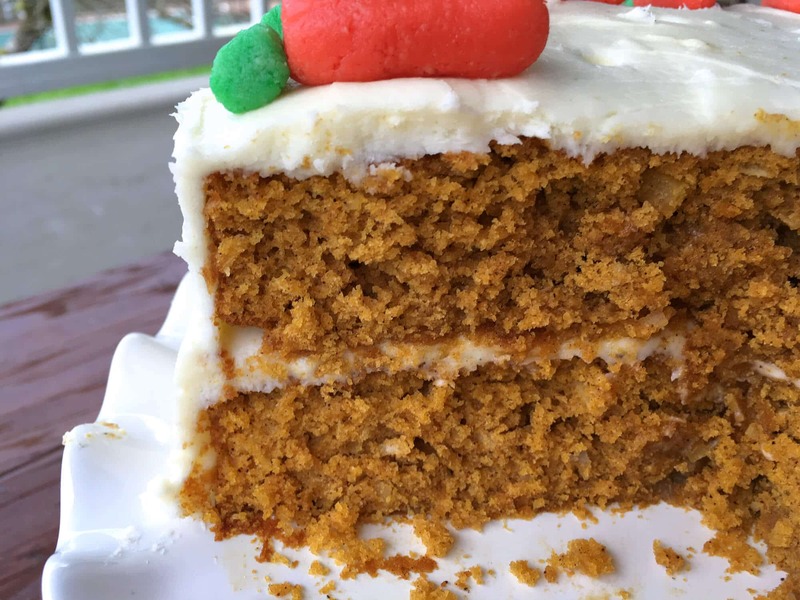 I’ve never tried carrot cake with pureed carrot, but I need to – your crumb looks perfect! I love the adorable little carrots on top too! My husband loves carrot cake I make one every year for his birthday. I’ll have to try this one! This looks scrumptious! I’ve never made a carrot cake before…I just started to like them (because I would never try them)and have been making carrot cake biscotti which I am loving. I think if this were in front of me right now…I’d do serious damage to it!! Love the addition of your adorable carrots!! The texture of this cake looks perfect!! Those carrots are also too darn cute! I’ve never had marzipan, but this cake looks fantastic!! 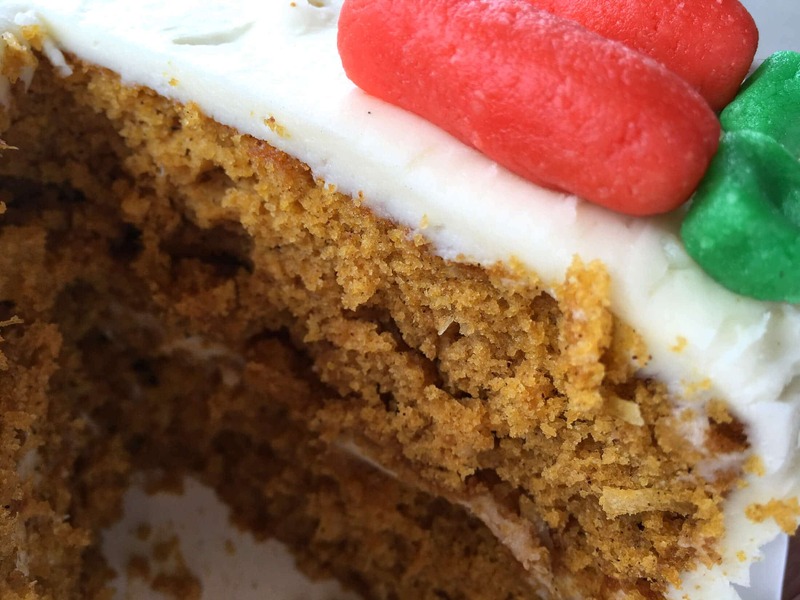 This is so festive and I love that it is gluten free! 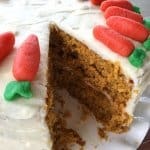 Carrot cake is a family favorite!! This looks terrific!! I can’t wait to try your version! Thank you for this, Kimberly! It looks sooo delicious, with health benefits, as well! Thank you for all you do to share your gifts with us and make our family friends’ dining lives beautiful! This is pretty!! Those tiny carrots are so cute! 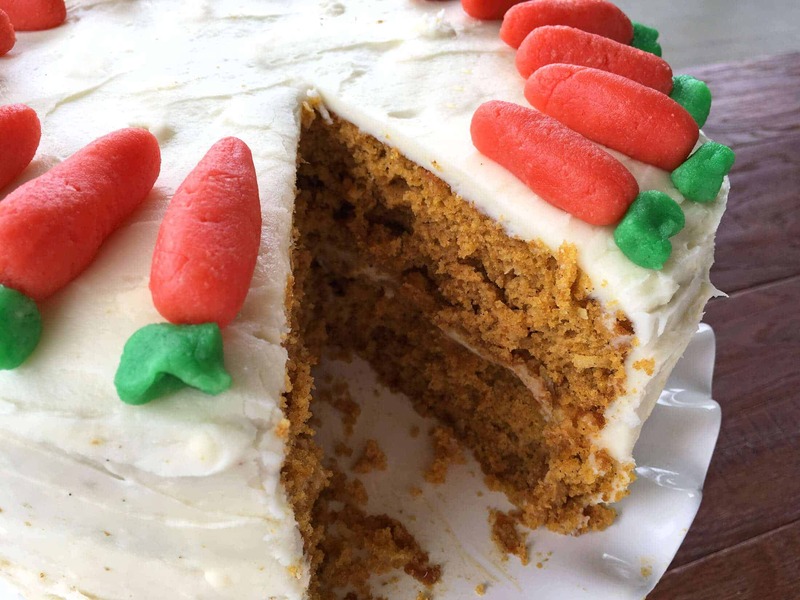 Carrot cakes are always delicious, my kids love them too. I have never tried a gluten free version though, but your cake definitely looks perfect. Oh, this carrot cake looks like PERFECTION! What a lovely sweet for the family! 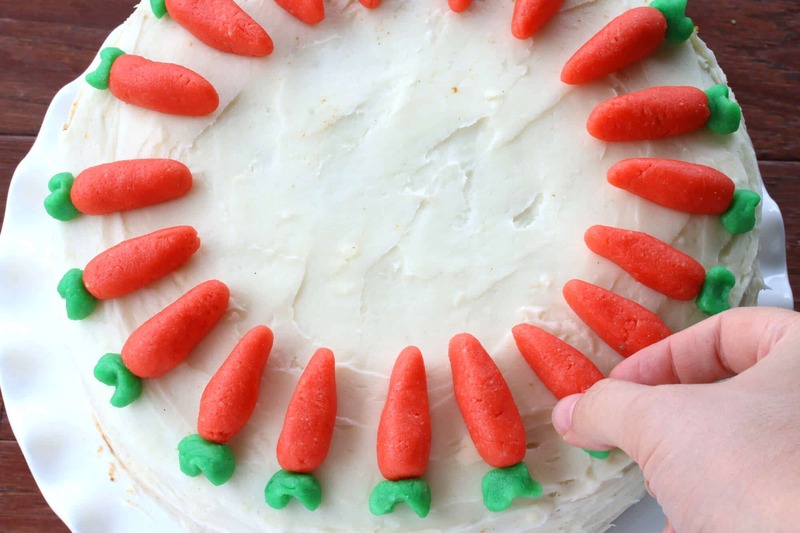 Those marzipan carrots are tooooooo adorable! My daughter would go crazy over them!!! Love that this cake is gluten-free — perfect for family get-togethers. Perfect carrot cake and I love those little carrots on top! Might have to make this for mother’s day! Can I ask why you are using cooked carrots rather than just fresh grated carrots? Thank you. 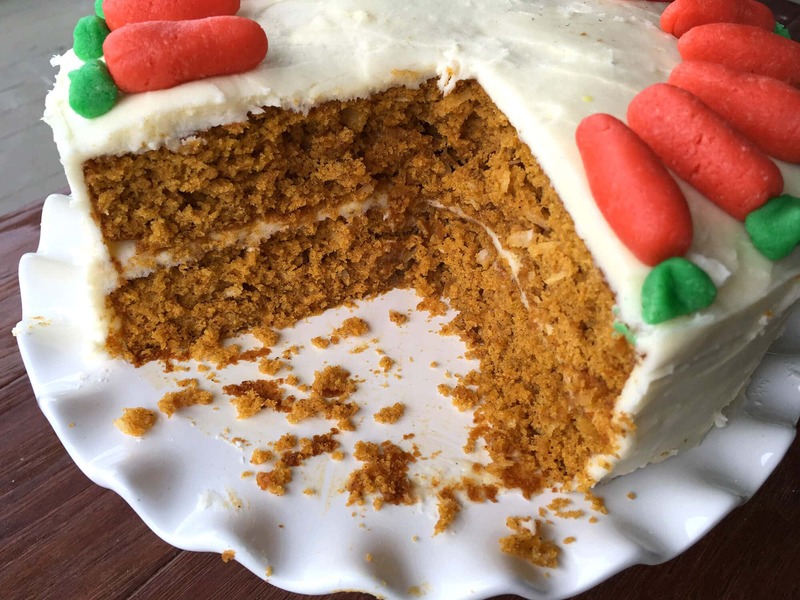 Hi Martin, after making this old-fashioned carrot cake I discovered that using cooked carrots not only enhances the flavor but contributes to a moister texture. Can this be made into cupcakes? Fantastic, Ginny, thanks so much for the feedback!